Rocket Mortgage: Has It Lived Up to the Hype? Rocket Mortgage blasted into our world during 2016’s Super Bowl 50 between the Broncos and the Panthers. At its peak, the game attracted more than 115 million viewers, and right in the middle of it all, Quicken Loans debuted their spot for Rocket Mortgage, setting both real estate consumers and professionals buzzing. The first completely online and on-demand mortgage process, Rocket Mortgage was created to take a complicated and confusing mortgage process and make it fast, simple and transparent, thereby encouraging many hesitant buyers to enter the market. Reinventing the traditional mortgage process, where the burden of proof was on the client to prove their creditworthiness, Rocket Mortgage automatically imports and verifies a homebuyer’s information and delivers customizable mortgage options, allowing many to get a fully approved, rate-locked mortgage literally within minutes. Rooted in Quicken Loans’ 50-state origination platform, Rocket Mortgage is available in all 3,143 counties across all 50 states. The question is, given such high aspirations and widespread publicity, where does Rocket Mortgage stand one year later? Has it sent the mortgage process into the stratosphere as intended, or has it come back down to earth? The short answer? 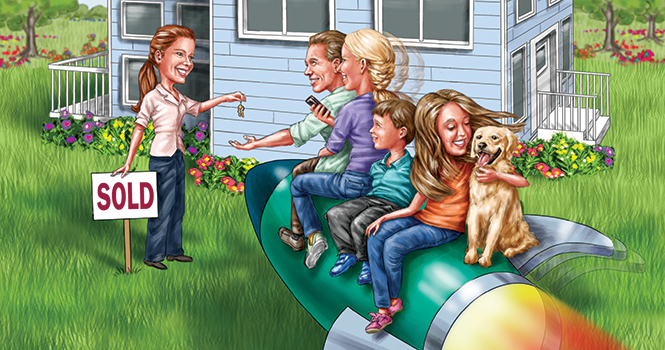 Rocket Mortgage has gone far beyond its original projections. More importantly, Rocket Mortgage has followed through on one of its cornerstone goals: to get would-be buyers off the fence and into the market. According to Quicken Loans research, as many as 60 percent of potential buyers are currently choosing to sit on the sidelines and not participate in today’s housing market. The No. 1 reason they give for not purchasing a home? A cumbersome and intimidating process. Coming off the Super Bowl ad, however, awareness for Quicken Loans and Rocket Mortgage skyrocketed, paving the way for a healthy purchase season early in the second quarter. Year one hasn’t been about basking in the success of Rocket Mortgage—it’s been a year of gaining important insight and adapting accordingly. For example, with such a huge influx of first-time homebuyers to Rocket Mortgage, many applicants had been living rent-free with family or received gift funds. These factors skewed the information typically looked at to establish financial wherewithal, so Quicken Loans made the necessary adjustments to the program to account for such factors. The other discovery Quicken Loans made this year was that while Rocket Mortgage has the ability to deliver mortgage approval within minutes, the speed of the process remained in the hands of the consumer. Another learning experience came in the form of the audience for Rocket Mortgage. While it was anticipated—and has come to bear—that millennials would comprise the bulk of Rocket Mortgage users, there is interest well beyond that generation. So how has Rocket Mortgage played out for consumers? Overwhelmingly positive, says Latka. Of course, client satisfaction is nothing new for Quicken Loans, which just won its 7th J.D. Power award in a row for customer service. Morgan McGregor is one of those satisfied customers. Having just purchased her first home with her fiancé in Bonita Springs, Fla., McGregor used Rocket Mortgage to secure her loan and found the process “really easy.” But prior to that, the thought of buying a home and getting a mortgage was overwhelming. According to McGregor, Quicken Loans was prepared to close her loan faster than she had ever expected, but she asked for an additional week or so. Rocket Mortgage’s customization feature is also a big part of the customer satisfaction equation. Clients aren’t just getting a quote; they’re able to make adjustments to receive an option that makes the most sense for them. For real estate professionals, Rocket Mortgage is an important conduit for clients in a competitive home-buying market. Getting approved for a mortgage and making an offer on a home as quickly as possible is critical for getting into the home of their choice. Rocket Mortgage also offers a significant advantage to buyer’s agents. The full approval Rocket Mortgage provides is much more comprehensive and accurate than a pre-approval, due to the electronic verification of the client’s income, assets and credit, and direct access with agency underwriting engines. Despite the success of Rocket Mortgage, Quicken Loans is taking no breathers. There’s a “long road map” of plans in place to make the Rocket Mortgage experience continually better. For real estate professionals, Latka reports that they will continue to educate and communicate the benefits of Rocket Mortgage to the market. Quicken Loans will also pursue further opportunities to integrate Rocket Mortgage into the Agent Insight Platform so real estate agents will have access to that portal without being in two separate environments. For now, however, Quicken Loans is focused on the big picture goal: increasing homeownership. For more information, please visit http://rocket.quickenloans.com. Maria Patterson is RISMedia’s executive editor. Email her your real estate news ideas at maria@rismedia.com.